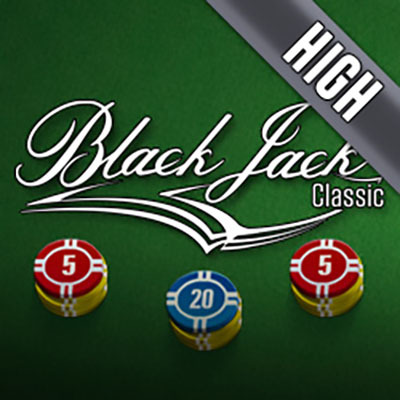 Blackjack Classic High delivers this timeless casino game, especially for high rollers. The game has kept all the elements of the traditional game of 21 with just a higher betting range. So buckle down, think strategies, dig deep and remember to breathe. This is going to be an exciting, brain-testing, pocket-reaching game! You can expect everything you normally would from Blackjack in Blackjack Classic High. The game has kept its premise clear and simple. The objective, as always, is to get as close to the sum total of 21. Once you hit 22 or go over you ‘bust’ – meaning you lose. Given that this is a high-stake variation of this game, we will share with you a quick tip. Although the aim of the game is to get as close to 21 as possible, an important thing to always remember is you don’t necessarily need a terribly big number to win, all you need is to get a higher number (that is obviously not above 21) than that of the dealer’s total. Once you’ve got that, it’ll be a dazzling moment of ka-ching-ching! There are obviously various strategies that you can utilize and bets that you can place to better your odds of winning. And with Blackjack Classic High, that is exactly what you should do in order to get the best returns. Below is a simple summary of the rules and potential bets you can place. - Most importantly, you need to know what your cards are worth. Thankfully Blackjack strives on simplicity and understanding the cards’ worth is no difficult task. The numbers 2 to 10 are exactly what they state themselves to be. Jack, Queen and King, are worth 10 each. While the Ace is the only card with a dual option, giving players the option of playing it as a 1 or an 11. - Blackjack in itself is a classic casino card game. But it also refers to a powerful winning hand that you can land within the game. This is pretty much the best card combination you can hope for as it translates to an instant win. To land a Blackjack, you will need 2 cards that add to a total of 21. These 2 cards have to be specifically an Ace Jack/Queen/King. - Insurance: An additional bet that can be placed if the dealer’s exposed card is an Ace. You only win this bet if the dealer’s next card is a picture – meaning the dealer would have to land a Blackjack in order for you to double your initial bet! Blackjack Classic High maintains the simple essence of Blackjack but multiplies the thrill significantly. With bets going as high as £500, you’re in for quite a ride!